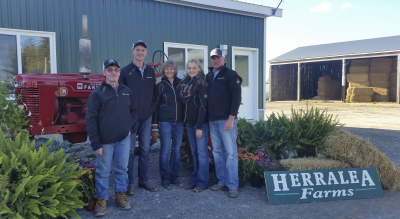 The Herrema family of Uxbridge, is a multi-generational farm family with a history of progressive achievements and community service through public services and rural leadership. The Herrema’s have an open door policy at their farm and have hosted several public tours at their farm property to highlight the diversity and value of agriculture. Involvement in public service has been a commitment of many years by two generations of this family and helped to ensure a valuable perspective on agriculture was always present when decisions were made at municipal and regional government. 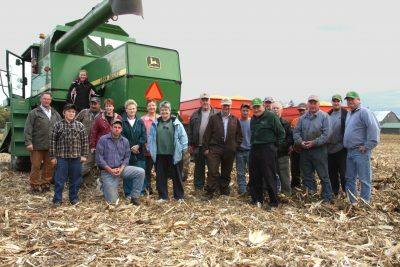 Rural and agriculture organizations benefit from the Herrema family’s involvement in leadership positions. 4-H and Junior Farmers clubs, Plowmen’s Association and the Uxbridge Fair are some of the recipients of this family’s commitment to the betterment of their community. With a recent major expansion of dairy barn facilities, the youngest generation, who are recent agricultural graduates of the University of Guelph, are committed to continuing the farm operation. The Mayor of Uxbridge, Gerri Lynn O’Connor said in the letter of support, “the future of this farm is very bright indeed”. The Epsom Utica Canadian Foodgrains Bank is a group that has been instrumental in helping to feed the hungry of the world for close to 35 years. Starting in the early 1980’s , inspired by the idea of two local men, the community would gather to bag grain to be shipped to Winnipeg, where it was further distributed to help with famine in the third world. By 1996, with continued strong community support and donations of time, equipment and crop inputs provided by farmers and agri-businesses, it was decided that they would grow their own crop for distribution. This project has grown to 73 acres with a rotation of wheat, corn and or soybeans. Now the harvested crop is sold and the proceeds are forwarded to the Canadian Foodgrains Bank, a national organization which is able to procure 3:1 matching funds from the Canadian government – giving more bang for their buck. This project is supported by a core group of farmers, people from the community, local church congregations and rural families as well as a Toronto church who provide monetary support in order to aid in fighting world hunger. 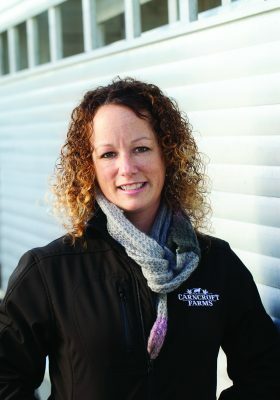 Jenny Carnaghan of Blackstock, an outstanding leader, passionate about rural communities and one who commits her time to make her local community and Durham Region the best place to raise a family and operate a farm family business. Jenny holds leadership positions on her local co-operative nursery school as well as the school community council and has been recognized by the Durham District School Board with a “Volunteer of Distinction” award for her contributions. She is not content to merely promote agriculture, but has been instrumental in developing an award winning & innovative joint venture value-chain marketing group, Trillium Lamb. Her involvement in a variety of community and agricultural organizations allows her to support initiatives to maintain and build strong rural communities for current and future generations.